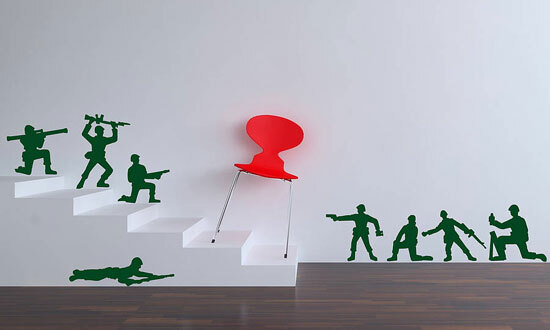 If your child is all about toy soldiers right now, then the Toy Soldier Wall Stickers by Parkins Interiors are the ideal room decor. There’s not a lot you can say about the design – it’s toy soldiers in decal form, precision cut from matt finish removable vinyl. Once applied, your wall sticker will look like it has been painted onto the surface with no outlines or border. Actually, that should be ‘stickers’, as there are 16 soldiers in different poses per pack, all easy to apply and remove and available in a wide selection of colours (as well as the toy soldier green).